A veteran airline pilot with thirty-five years of experience, including many flights into San Francisco International Airport (SFO), has told Breitbart News that “wake turbulence,” in combination with pilot error, could have caused Asiana Airlines Flight 214 to crash on Saturday, killing two passengers and injuring dozens. Wake turbulence is caused by a heavy aircraft, resulting from the displacement of air over the wings. In an exclusive interview with Breitbart News, former Captain Ted White explained how wake turbulence could have contributed to the the Asiana crash, causing pilots to lose control on final approach. A small commuter aircraft that landed ahead of the Asiana flight had encountered such turbulence on landing, he said, citing news reports. 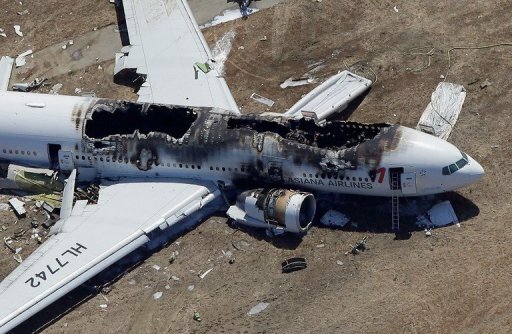 In addition, White said, given that the ground-based instrument landing system (ILS) was not operational at SFO, the Asiana pilots could have substituted the manual flight guidance system for vertical guidance in determining the altitude of the Boeing 777. That, in turn, could have caused them to mistake the manual glide path it for the electronic ILS glide slope, leading them to approach the runway at too low an altitude. Capt. White, who retired in June 2012 from Hawaiian Airlines, told Breitbart News that such an error could easily have happened. “In my flying career, I’ve recognized there are several traps that can happen to a pilot even in the best of conditions. You can let your guard down when it’s a clear day and everything seems good. Officials are examining the possibility of pilot error, but are still open to other explanations. “Everything is on the table right now. It is too early to rule anything out,” National Transportation Safety Board investigators told a news conference on Sunday afternoon, praising the first responders who attended to the injured.